Photo by Autumn Walter|CIGAR| Cam LaFleur fires home on a sunny day at the Beck. 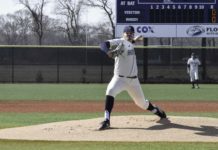 The University of Rhode Island baseball team came into this weekend’s series against the University of Massachusetts still hungry for their first conference win. Since then, Rhody has won three of their last four games and look to continue the stretch into the upcoming home stand. The Rhode Island softball program struggled at home this weekend dropping two matchups with the Fordham Rams. The teams were supposed to meet Sunday afternoon for game three of the weekend set but due to inclimate weather the game was cancelled. Friday, the baseball team and UMass battled out a 3-3 tie into the bottom of the ninth inning, when UMass’ Ryan Levers hit a walk-off single off of Rhode Island closer Tyler Barss. 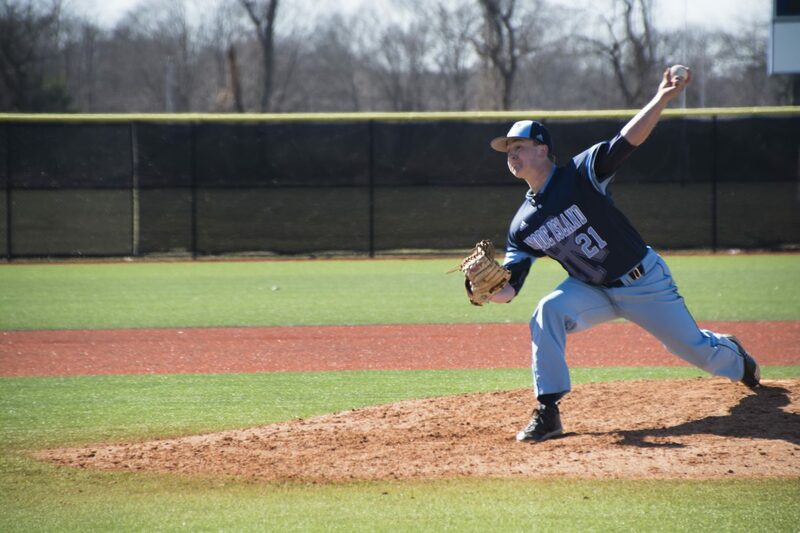 However, the Rams rolled into Saturday’s games with vengeance, sweeping the double header and earning their first series win and first two conference wins of the season. In game one on Saturday afternoon, Rhode Island used a sixth-inning rally to power themselves past the Minutemen. Looking at a 1-0 deficit, the Rams loaded the bases and freshman Xavier Vargas came through with a two-run double. In game two, URI was able to capitalize on defensive mistakes made by UMass to earn themselves a 6-3 victory in the rubber match of the series. Rhody plated three runs thanks to UMass errors, and were able to use big innings in the fifth and sixth to push ahead. 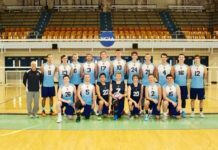 Tuesday afternoon, URI traveled to Boston College to play the Eagles in a mid-week matchup. They fell behind 1-0 in the first, but used solid relief pitching and a seventh-inning rally to push past BC. Vargas led off the seventh with a triple, followed by a walk to Matt Daller. Mike Foley then scored Vargas on a sacrifice fly, and Daller was able to score on a Laurence Hill single following Foley’s sac fly. Hill stole second and was plated by a Jordan Powell single later in the inning. Jake Walker started for the Rams, and after five complete innings of one-run ball, he was relieved by Mark Silvestri. Silvestri was credited with the win, and followed in relief by Tyler Barss and Nick Johnson. The bullpen threw four innings with no earned runs in Tuesday’s victory. 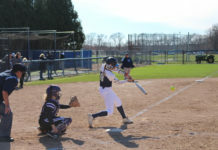 It was a battle of the Rams this past Saturday at the URI Softball Complex as the visiting Fordham Rams took on the Rhode Island Rams in a doubleheader. It was the Rams of Fordham coming out on top as they took both games by a score of 10-0 and 7-0, respectively. The first game was dominated by the Fordham bats as they bashed three home runs to put up ten runs and mercy URI in the fifth inning. Fordham got started right away as freshman sensation Paige Rauch lead off the game with a home run into the right field corner. URI would keep it at a one run deficit until Fordham busted the game game open with a four run fourth inning and then came back with a five run fifth. Thanks to Rauch’s second home run of the day and a grand slam courtesy of Madi Shaw, Fordham put the Rams to bed early as they mercied them in just five innings. On the other side of the ball, pitcher Madie Aughinbaugh was in full control on the mound as she allowed just one first-inning double to Melanie Martire but was otherwise perfect. Game two started off all too similar for URI as Rauch launched her third home run of the day and kept Fordhams bats hot for the second matchup of the day. That paired with a Chelsea Skrepenak two run home run was all Fordham needed to complete the sweep. Rauch also got the start in game two and had a no hit bid going into the fifth until sophomore Erica Yeager hit a line drive into right. URI is back in action this Saturday at home as they play another double header against the St. Joseph’s Hawks. The games are scheduled for 12 noon and 2 p.m.